This week's topic is 'Luck'. And, since it's a Tails week, we are given instructions on what we are supposed to write about ... So, I am here to tell you a couple ways that luck has played a part in my life. Well, I have to admit, that most of the times that I have considered myself 'lucky', I give more credit to God's intervention than I do mere luck. When I was young, my dad and a large group of his friends rented a very large campsite on a yearly basis. Each family owned a dune buggy, and the campsite was near acres and acres of hills for riding dune buggies, ATV's, and dirt bikes. One night, when I was still quite young, I was asleep in the tent. I was having a dream that one of the other kids who camped with us had thrown a cardboard box on top of me (Hey, I realize it's silly, but I didn't write the dream). So, I'm dreaming that I've had a cardboard box thrown on top of me, and I wake up and try to sit up... but, I can't move, because something very heavy is holding me down. Oh, no problem, I think... I'm still asleep and dreaming that this box is on top of me. So, I'm quite relaxed for not being able to move, because after all, I'm just dreaming. I lie there for awhile, mentally telling myself to wake up because I'm feeling kind of uncomfortable. So, again, I try to sit up, and still, I cannot move... then I realize (I'm a little kid, remember) that if I were asleep, I probably wouldn't be lying here having a mental conversation with myself... At this point, I also realize that if I were asleep, I shouldn't be feeling like I am having some serious trouble breathing. I think, well, I'll just say something out loud and see if I'm really asleep or awake... so I say "Hey, help"... nothing... but, then, I'm hearing talking and commotion, so, again, a little bit louder, I say "Hey, help"... and then I hear one of the guys who camped with us yell "Oh Sh*t! The buggy is on the kids!" Within a few seconds, the weight is lifted off my chest, and I find myself sitting up in the tent gasping for air, although I had not realized until now exactly how much trouble I was having getting air. Next thing I know, I am being carried out of the tent with adults all around me asking if I'm ok and where does it hurt. I wasn't hurt, but I was very confused, after all, I had just had the weirdest dream! It turns out that, someone was parking one of the dune buggies, the clutch went out on the buggy, and the buggy rolled over the tent that I was sleeping in. The buggy was over top of me, basically straddling me (a tire on each side of me). That's why I couldn't move, because the buggy was sitting on top of me. I am very, very lucky that I was having that dream and incorporated what was really going on into the dream. Otherwise, I may have struggled when I couldn't move or breathe, and I could have seriously been hurt. I am also very lucky, because the next morning, my dad took my hand in his, took me to the tent and said "Do you want to see how lucky you are?" The tire marks were on the tent - somehow (God's intervention), the tire marks curved right at where my pillow was - I just missed having the buggy roll over my head, instead, it straddled me! Gosh - I can see already that this is going to be a rambling post - so I don't blame ya if you don't read the whole thing! I have passed the tests!!! I passed the tests!!! WooooooHoooooo. Now, I have two work-at-home jobs. I can work from home, not have to spend a fortune on gas, not have wear and tear on my vehicle, not have to drive a long way to and from work, not have to drive in the winter, can actually be proud of myself and happy with what I'm doing because this is what I wanted to do rather than succumbing to what everyone else said I should be doing. Yes folks, I am a very lucky (and thankful) girl! Oh - and I am very, very lucky that I have a wonderful husband, family members, and friends (the real-life ones, especially my two best-friends, and all my online friends). I'm lucky that my partner-in-crime nagged me to convinced me to give blogging a try, because that has led to my being lucky enough to meet all of you and consider you my blogging friends! I loved your story, but I don't think Luck was on your side (mainly because I don't believe in it) I think God had his hand over you and that's why you were ok.
Ps. We don't mind the bug on our flowers, we can share too! Woo Hoo!! Congrats on the job! Yay!!!! I knew you'd pass! I KNEW it!!!! That's amazing about the dune buggy. You were indeed lucky! I'm tagging you with My Middle Name Is meme. I know you already did it a while ago, but you can do it again if you want. What a great post! I can totally feel your excitement! Congrats on your new job! That first story is so scary. You WERE very lucky, huh? I AM SO excited for you!!! See, you were worried for nothing :) Big hugs to you for passing. You were very lucky that day in the tent!! wow, gave me shivers. I love this post. The dune buggy was indeed a miracle. That is truly a scary moment. 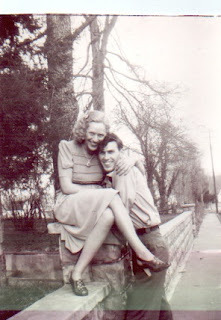 I love the picture of your grandparents. What a happy couple. Congrats on passing the test. God has certainly blessed you in so many ways! What a great post. BTW, I wanna work from hom. Congratulations! One lucky day, one!!!!! We are in Dayton Ohio. We are going to spend 6 days here and move into Kentucky. I don't know where you are in Ohio but I hope you missed the major storms. I know the rain was needed but after 3 hours I was looking around to see if someone was building an ark. Enjoyed your post. Congrats on being able to work at home! Yea! on your test results! you have been very lucky...and very blessed in your life. I can't believe that about the dune buggy - that's crazy. At least somebody realized it soon enough and luckily you guys raced dune buggys and not Panzer tanks. wow... you have been lucky... Way to go!!! Keep it up. A good post for the meme. You are indeed lucky in the respects that you have posted about. Thanks for stopping by my blog.